Leading European flightcase manufacturer 5 Star Cases has launched a revised range of ‘Industrial Rack’ products aimed at professional lighting, sound and video applications, and also to house telemetry and telecoms equipment for installations and mobile use. The Industrial Rack range is currently available in variants of 4U to 20U – in increments of 2U – to offer full flexibility to users and specifiers working in different sectors. The rack shells are made from 9 mm birch ply with a high-pressure laminate (HPL) exterior, and like all 5 Star products, are built to rugged, high quality specifications and tough enough for the most exacting environments. Eight standard HPL colours are currently available offering a variety of smart, dynamic finishes. The main body depth is a standard 550mm, complete with 62 mm deep internal removable doors. The racks are fitted with front and rear punched steel rack strip, together with quality Penn Elcom butterfly catches and recessed handles. Premium 4" inch casters are available as an option. Two of these are standard and two are braked for hold position when stationary or during transportation. Rear door casters fitted to plywood runners are available for the 12U upward models, and these tip-able racks are also fitted with an additional four handles down the sides in the crossed configuration – for ease of handling. M6 rack nuts, bolts and washers are all included in the price. 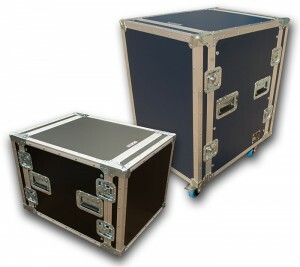 The range has been designed and built in the UK at 5 Star’s extensive manufacturing facility in Wisbech, Cambridgeshire, and further expands their already comprehensive choice of excellent off-the-shelf flightcase products. Custom orders can be designed and built as required.